BitLife Life Simulator Business School – How To Become CEO? Becoming a CEO in real life is not quite easy. 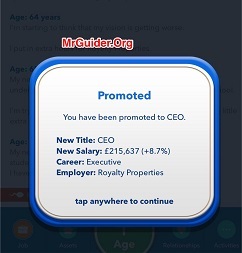 But in the virtual life, BitLife – Life Simulator game lets you become a CEO of a company in no time. And, it merely takes a minute. All you need to do is follow this walkthrough and that’s it. (Tl; Dr – The very first step you have to do is choose the right path in the education career. Then you will have to apply for the business school. After that, you will apply for a corporate job and work in a single company for about 15 years. Then, you will resign from the Jr. post job and apply for the assistant vice president job. Then you will work hard every year and the company will promote you to the higher post; AVP -> VP -> First Vice President -> Senior VP -> Executive VP -> Managing Director -> CEO). 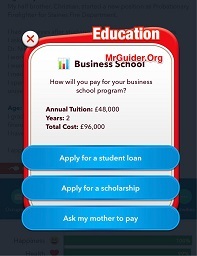 Let’s have a look at our BitLife – Life Simulator Business School and CEO walkthrough guide! After you complete the education in primary and secondary school, the game will prompt you to choose an education path. 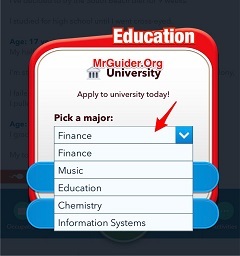 Tap on the drop-down button and you will see many options; Finance, Dance, Engineering, Arts, History, and more. To become a CEO or get into the business school, you need to graduate from university with an undergraduate degree in Finance. Now, there is no guarantee that you will get the Finance option. If you don’t get the Finance option, we would recommend you to start a new life. Bonus Tip -> When you start a new life, pay attention to your father and mother’s Job. If it’s finance related, continue with it. Or If they are poor or working in other sectors(for example; dance), we would recommend you to start over. It would be better to start with a virtual character whose parents are working in the finance sector. We have noticed many times that the Job of parents also matters. It could be wrong, but worths a try! ⇒Tap on the school button -> work hard every year. So that’s the first step to get into the business school and become a CEO. Let’s head to the second step. Once you are graduated from university with an undergraduate degree in Finance, the game will prompt you to make a decision; seek higher education or look for the job. A finance degree would not help you to become a CEO. Choose to seek higher education and apply for the business school. Your application will be approved. Now, you have to pay for the tuition fee. You can get help from the parents, apply for a student loan or scholarship. So that’s the second step to become a CEO in BitLife – Life Simulator game. If you want to become a CEO in BitLife, you should apply for the corporate sector job. As soon as you graduate from the business school, the game will prompt you to look for a job. You can decline or pick a job. If you decline, your mom will put pressure on you to get a job. Tap the occupation button -> jobs -> find a Junior(Jr.) level job in the corporate sector. For example; Jr. Environmental Scientist(Corporate). As we mentioned above(In the TL;dr part), you will have to apply for the assistant president job to become a CEO. To get that job, you must have 15 years experience in the corporate sector. So work at the Jr. level corporate job for 15 years. Tap the job button -> work hard every year. After the 15 years, resign from the Junior level job and browse job listings. After working in the corporate sector for 15 years, resign from the post. Tap the job button -> resign. 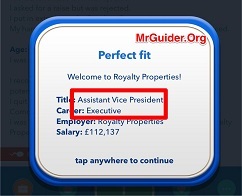 Tap the occupation button -> Jobs -> apply for assistant vice president job. While working as an assistant vice president, an event will come in which you will have to make a decision on a business tour with your colleagues or boss. Make sure to attend the meeting or go for a business tour. 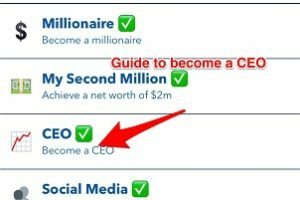 So this is the complete walkthrough – BitLife – Life Simulator Business School and How to become CEO in Bitlife – Life Simulator. There might be more ways of becoming a CEO. If you know any other way, share the walkthrough in the comment section below.